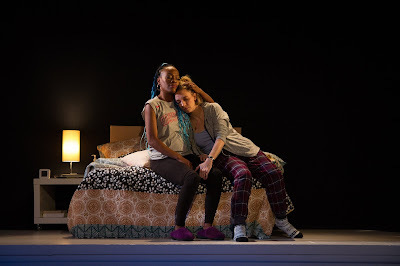 Aaliyah Habeeb and Mel House will star in Christina Gorman’s cyber-espionage love story, Roan @ The Gates, directed by Michelle Tattenbaum at Luna Stage. This World Premiere features an all-female cast and female-led creative team. Previews began January 31, and the play opens Saturday, February 2 for a limited run through Sunday, February 24. Set in Washington D.C. and Russia, Roan @ The Gates explores what happens when personal lives collide with national security. Mel House plays the role of Roan, a data analyst for the NSA, and Aaliyah Habeeb is Roan’s wife, Nat, a lawyer committed to human rights advocacy. Recognizing that during the recent government shutdown, the play’s protagonist Roan would have been furloughed, Luna Stage jumped to offer complimentary tickets to federal employees affected by the shutdown. For the run of the play, free tickets to Preview and Thursday performances are available in advance, and tickets to all other performances are available one hour before at the box office to all federal employees who were (and may still be) affected by January’s shutdown. Tickets to Roan @ The Gates are $16-39, and tickets are available at LunaStage.org/Roan or by calling 973 395 5551. A limited number of premium Opening Night tickets are available for $59, including the post-show party with cast and creative team.